It is once again June in Milwaukee, Wisconsin, and we have arrived at the Bead&Button Show, this time with my sister and youngest niece. This is already the ninth year of this annual event, which attracts teachers and students, sellers and buyers, and company representatives from all over the world. Many of these people are highly dedicated beaders who can bead while eating or drinking, walking or talking, flying or driving. And while they sleep they bead in their dreams. The first days of the show usually feature Master classes. This year the masters were Valerie Hector, Alan Revere, and Kristina Logan. The general education classes started later. Starting early in the morning one could see ladies carrying their yellow B&B souvenir bags on their way to the Midwest Airlines Center. 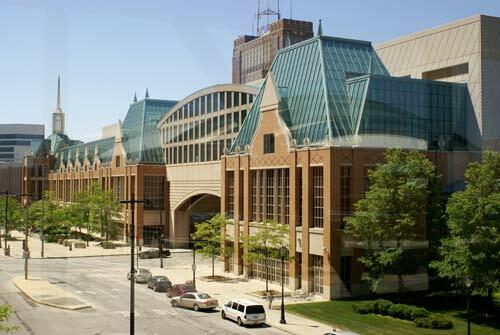 Classes were held on all three floors of the building as well as in the nearby Hilton and Hyatt hotels. Many people registered early online, but it was also possible to register and sign up for classes on site. At the Meet the Teachers Reception one could examine samples and buy instructions and kits. 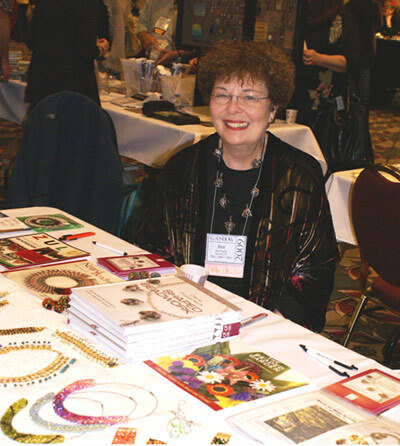 One could also talk with such famous beaders as Dianne Fitzgerald and Sheri Serafini, as well as buy their latest books and have them autographed. 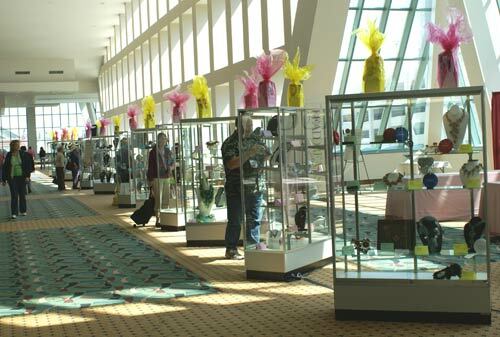 Without doubt one of the biggest events of the show is the exhibit of the Bead Dreams Contest. The results of this contest are anxiously awaited by beaders throughout the world. The exhibit was set up in the sun-drenched foyer of the third floor. And again this year the Best in Show prize went to a beader from Japan , Satoko Toyoda from Tokyo . When I saw her magnificent piece, called The Sparkling Treasure Chest , I almost had a heart attack! Some of the people admiring this work said it is difficult to make anything better than the works of the Japanese women, as they live right next door to the factories which make the best seed beads in the world. The works of well-known masters such as Diane Hyde, Sheri Serafini, and Heidi Kummli were on display alongside those of talented young newcomers such as Melissa Grakowsky (Connecticutt), whose piece, Ceremonial Headdress , attracted much attention. 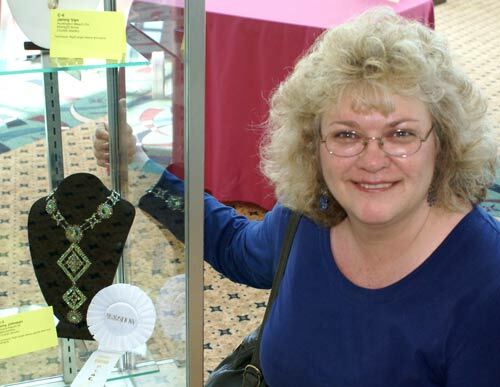 Melissa began beading just two years ago, and this was her first contest. Congratulations to Melissa on winning third place in the Bead Objects or Accessories category. Amy Johnson ( Michigan ) also did very well. She had three works on display, and one of them, named Metropolitan , won third place in the Crystal Jewelry category. 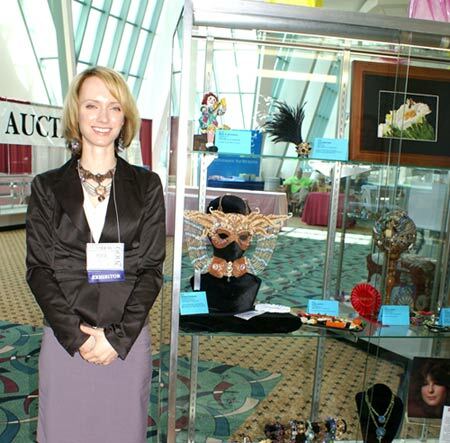 In addition to Bead Dreams the show featured three other competition exhibits. 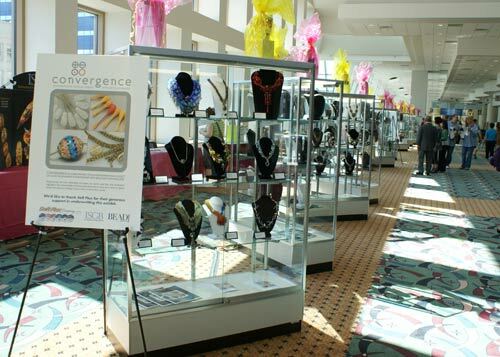 One of these, titled Convergence: Contemporary Jewelry Design with Art-Glass Beads , is a collaborative Bead&Button magazine/International Society of Glass Beadmaker's annual competition. 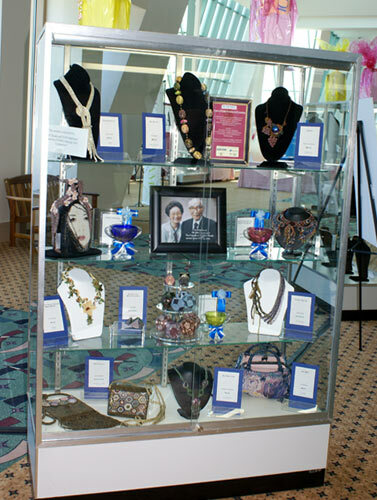 The other two exhibits, both Japanese, were the exhibit of the annual contest of the Coronet Co., Ltd. and the Japan Association of Leisure and Culture Development (JALD), and the first ever exhibit in the USA of the TOHO Beads Company's Treasures of TOHO Emerging Artist's Competition . The TOHO exhibit was dedicated to the memory of company founder Mr. Ichiyi Yamanaka, who passed away early this May. Among the finalists was the incredibly beautiful purse, called Iris Mist , made by Guzel Bakeyeva from Moscow , Russia. 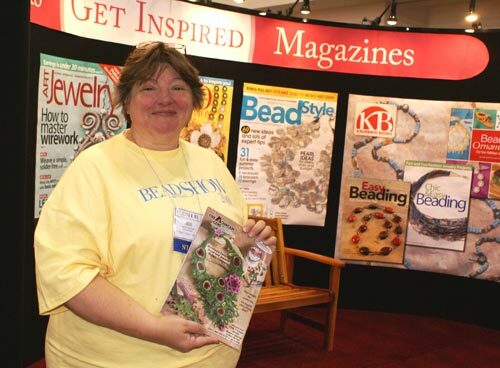 This year the Kalmbach Publishing Company, which publishes Bead&Button, BeadStyle, and Art Jewelry, celebrated its 75 th birthday. For three days these three magazines hosted jewelry-making demos, where participants could talk with magazine editors about published projects. 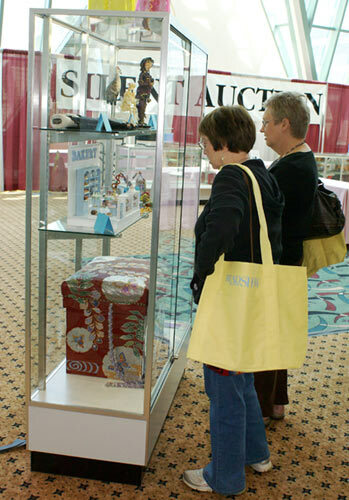 Yet another important event at the B&B Show was the Silent Auction , which raised money for breast cancer research. 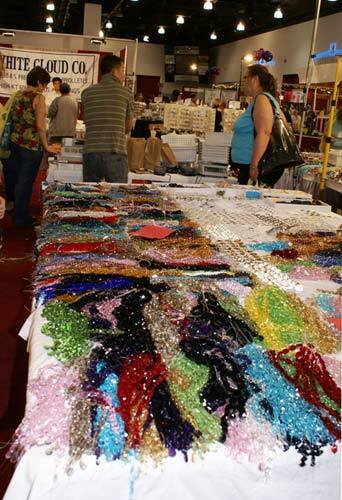 But of course the biggest event at the show was the shopping at the Bead and Jewelry Marketplace, where one could buy anything one needed, including hand-made lamp work glass beads, small seed beads of any color you can imagine, souvenirs, tools, thread and wire, Swarovski crystals, and pearls and gemstones. 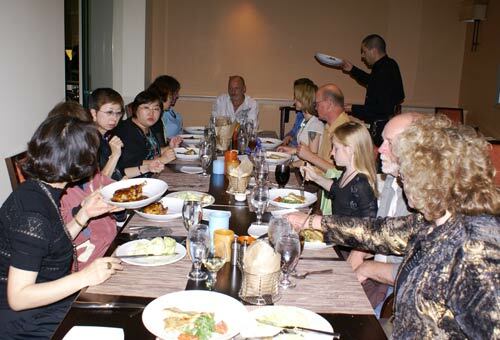 For many of us the B&B Show is not only an opportunity to learn new things, buy materials, and admire the beautiful exhibits, but also to meet old friends and make new ones. For several years now we have observed the tradition of sharing a late supper with friends on the first day of the Bead Market. This year I had a special reason to celebrate: 50 years ago I began beading. At the beginning of our party my dear friend Huib Petersen sang Happy Birthday, and then we all talked for a long time about seed beads and beading. Near the end of our get together, we showed each other and tried on examples of our latest works. This was my best birthday party ever. Unfortunately, we could stay until the end of the show but had to return home. 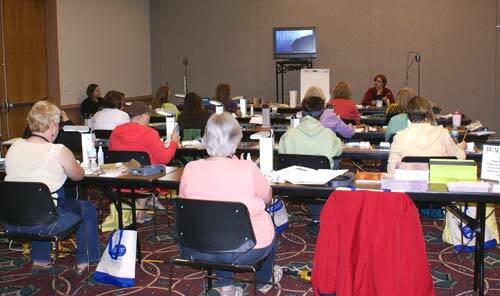 So it was good-bye Bead&Button Show, until next year! Классические минеральные удобрения в ассортименте на сайте grow.in.ua.